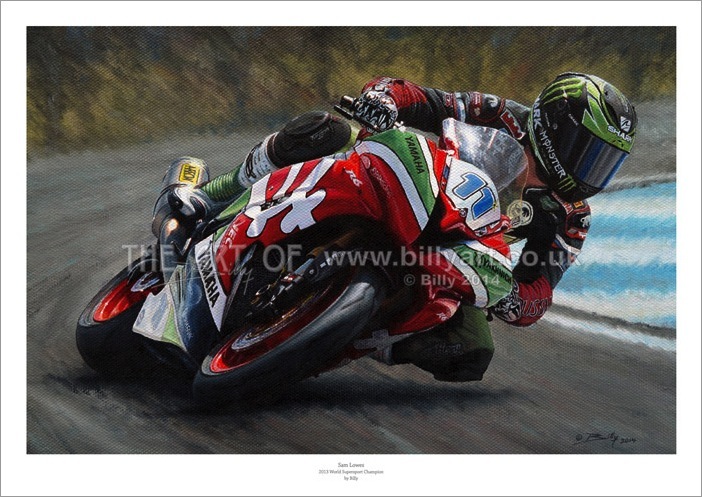 Sam Lowes 11 open edition giclée fine art print by Billy. This is a brand new open edition fine art print of fans favourite Sam Lowes riding the Yakhnich Motorsport Yamaha YZF-R6 to become the 2013 World Supersport Champion. The scen in the painting if from Sam's home win at Donington Park race circuit. This open edition print of Sam is a giclée print on archival matte art paper using Ultrachrome K3 inks and each print is signed by Billy. The fine art prints of WSS champion Sam Lowes are taken from Billy the artist's A4 oil on canvas painting. The print is available in A4, A3 and A2 and is embossed and signed by Billy. Painting the Sam Lowes art. *The fine art print of Sam Lowes has free UK Post and Packing. International orders have an additional cost as I will use Royal Mail 'Airsure' or 'International Signed For' to ship them. Simply use the drop down button by the BUY NOW to select the size print you require from either the UK or International prices. If you wish to purchase more than one print internationally then please contact Billy and a single paypal invoice with the total price and one shipping fee can be sent to you.